The creator of a popular parking bay garden in London Fields has been told to up sticks by the council – or face seeing her decorations wheeled away. Pro-walking campaigner Brenda Puech was refused permission by the council to pay for a parking space for anything other than a car. But the disability access consultant from Stoke Newington went ahead anyway, adorning the space with artificial grass, chairs, an umbrella and flowers. The parklet has proved a huge hit with visitors. Her lawyers have appealed against the notice, claiming the council made a “wrongful decision” by not allowing her to purchase the parking spot for community use. Puech, who campaigns for walking charity Living Streets, has also started a petition calling on Mayor Philip Glanville to let her creation stay. At time of writing, it had been signed by over 700 people. Puech is now urging the Town Hall to use the People’s Parking Bay as a trial, saying: “I’m proposing a pilot programme. The council can let this remain as a community initiative and gauge public reaction themselves. “People in the community are looking after it. When it was vandalised, local residents helped clear it up and put it back together. 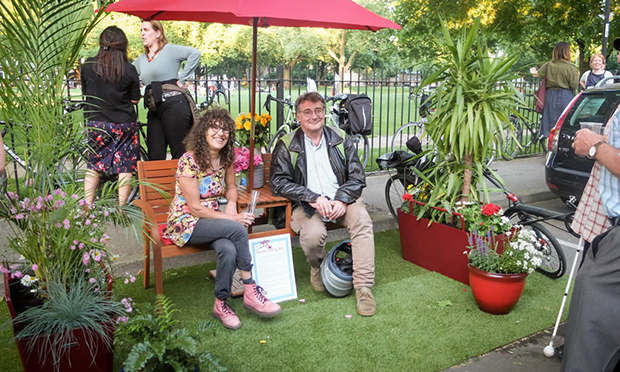 The Town Hall, along with Islington and Tower Hamlets, partnered with the Zero Emissions Network to launch a parklet in Shoreditch last month, which replaces two car parking spaces with seating, cycle bays and greenery. Puech opened the space at the end of May, with Green Party London Assembly member Caroline Russell in attendance. A Hackney Council spokesperson said: “Despite high levels of parking demand in the borough, Hackney Council is committed to improving the quality of life for our residents and ensuring that the borough remains the most liveable and sustainable borough in London. “We have demonstrated this commitment through recent projects to reduce through-traffic in our neighbourhoods, supporting walking and cycling, installing over 210 on-street cycle hangers providing secure cycle parking for our residents and creating a new Parklet in Shoreditch with support from local businesses. “While we support the aims of the Living Streets campaign, Hackney Council does not allocate parking spaces to individuals, with parking permits giving residents or their visitors the right to park in a space in a parking zone. The petition to save the People’s Parking Bay can be found here. Update: this article was amended at 13:32 on Monday 3 July. The original article stated that Ms Puech had purchased a parking permit. Her application for a parking permit, and her offer to pay for one, were both refused. 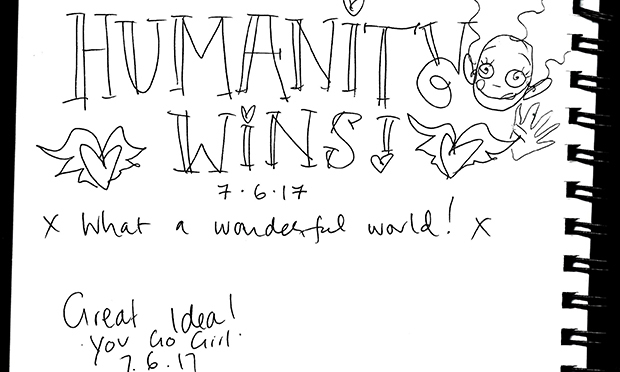 Update: this article was amended at 15:46 on Monday 3 July to include a comment from Hackney Council.